I’m going to start off today’s article by bringing up an art event in Seattle. Why, you ask? Greenville gallery, Somerville Manning, will be posted up there for the Seattle Art Fair on August 2nd – 8th. I lived in Seattle for a few years, wrote art coverage there as well, and am heart-warmed to see the intersection of the Brandywine Valley and the Emerald City. While in Seattle, Somerville Manning will be showcasing works by the Wyeth triumvirate (N.C., Andrew, and Jamie, in descending order), Bo Bartlett, Francis di Fronzo, and Kennett Square’s own, Bob Jackson! 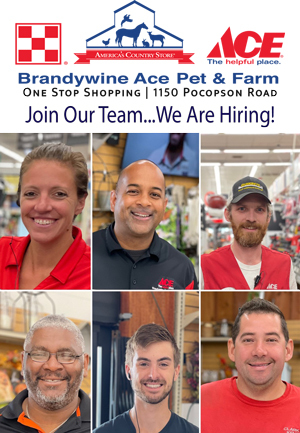 Brandywine Valley, represent! Okay, okay, we’ve also got some local happenings to address as well. 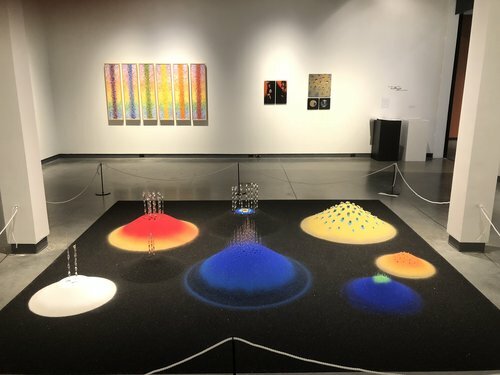 The Delaware Contemporary introduced a new exhibition, “Fusion,” last week featuring work by Allen C. Smith and Connie Zehr. Check out the exhibit on its’ opening night, August 3rd, which coincides with the Wilmington Art Loop. Taking in this exhibit might elicit the feeling one might have upon being dumped into a sci-fi fantasy scape. 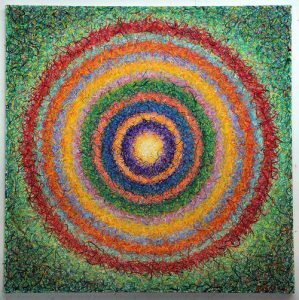 Smith’s paintings, created with the unpredictable, yet rigid process of the coin tosses (to select color) burst with energy and mingle in the genre of abstract expressionism. Because his colors are chosen at random, his color palettes are varied and unique, making for a bold backdrop to Connie Zehr’s sand installations. In the middle of the gallery, Zehrs’ sand dunes create a magical, quiet (yet frenetic, like tv static) presence that reminds me of a martian landscape. The glass structures emerging and hovering within the sand, add to the otherworldly atmosphere of her installations. Check out this exhibition during the next First Friday. 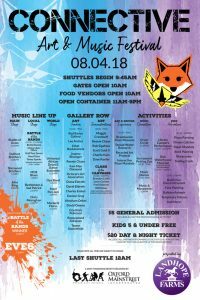 Fusion runs through November 4th. Next month we have the First Annual Connective Art and Music Festival in Oxford. This all day, family friendly event, sponsored by Landhope Farms, and co-organized by Oxford Art Alliance and Oxford Mainstreet Inc. What’s this going to look like? The festival has three different music stages, Main Stage, Local Stage, and World Stage. You’ll be treated to a smattering of local and international music, from Blades of Grass, DuPont Brothers, Sherwood Brothers, and John King on the Mainstage, to a Battle of the Bands on the local stage, and ending with Mariache Flores on the World Stage. 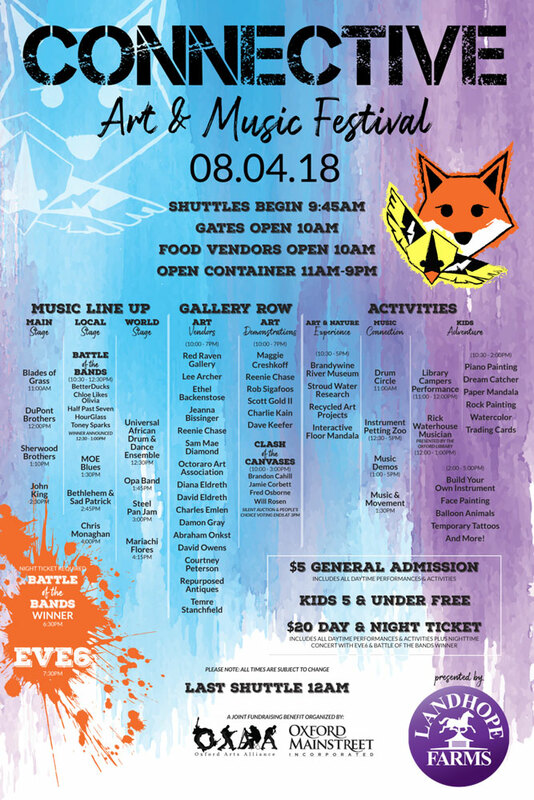 Connective will feature a Gallery Row, (what a cool addition to a festival) featuring Red Raven Gallery, Octoraran Art Association, and several local artists. You can pop by for some art demonstrations by sculptor Rob Sigafoos, or potter Maggie Creshkoff, and check out the Clash of the Canvases featuring artists Brandon Cahill, Jamie Corbett, Fred Osborne, and Will Rosen (vote for your favorite art, here). There will be tons of activities for the little ones, from facepainting and balloon animals, to crafts like piano painting, make your own dreamcatcher, or build your own instrument! Stick around for the evening concert featuring the Battle of the Bands winner and 90s nostalgia headliner, Eve 6! Next week, tune in to Art Watch Radio WCHE 1520 AM as Amie Potsic, artist and curator, hosts – Philadelphia artist Thomas Judd. Tune in this and ever Wednesday from 1-1:30 for your Art Watch fix! Until next week!